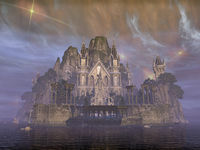 When Artaeum was "removed" from Tamriel, a few neighboring isles went with it, including the site of the Grand Psijic Villa, a monumental estate with magnificent views of the south coast of the main island. Grand Psijic Villa is a large player house in Artaeum. It is accessible through a portal on the southern shore of Artaeum, which you can reach via the College of Psijics Ruins. This house was rewarded for free to owners of Summerset who logged in at any point between their initial purchase of the Chapter and the conclusion of the Summerfall Event, albeit without furnishings. It features an expansive outer courtyard and a large inner grand hall. The following tables were gleaned from the Public Test Server, and would have been the starting furnishings if the house had been placed for sale in the Crown Store as originally planned. When this house was given away for free as part of the Summerfall Event, it was provided without any furnishings whatsoever. The house has been in the worldspace of Artaeum since Update 18 was on the PTS, though the teleportation pad could not be used and the door leading to it from the college was locked. In Update 19, the door in the college was unlocked and the house could entered from the teleporter, adding the location icon to the map. As evidenced by maps from playthroughs of the alpha state of Summerset at Bethesda expos, the house was not initially added to Artaeum. After it was, the buildings on the southwest coast were also added in.